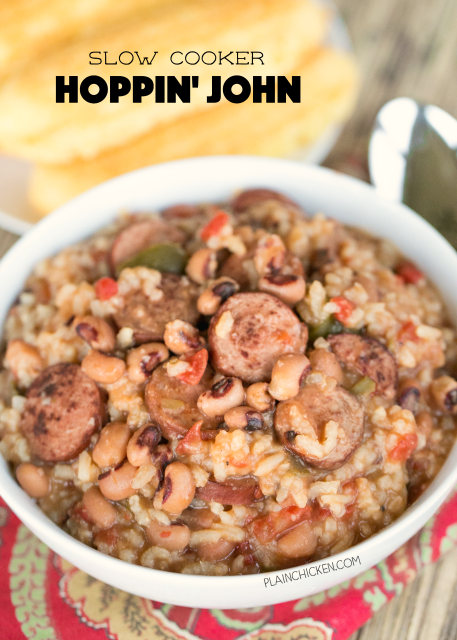 Slow Cooker Hoppin' John - perfect for ringing in the New Year! Black Eyed Peas, diced tomatoes and green chiles, smoked sausage, beef broth, onion, bell pepper, cajun seasoning and rice. Comfort food at its best! All you need is some cornbread and you are ready to eat! 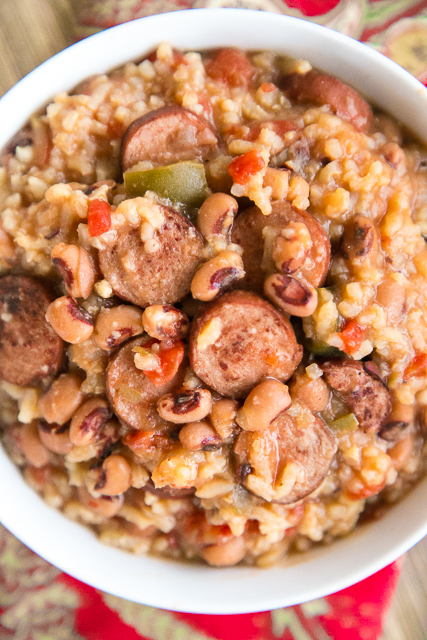 Black eyed peas are a must for New Year's in the south. You need to eat black eyed peas for good luck in the new year. I never ever take any chances! We always have black eyed peas on New Year's Day! This year we are having this Slow Cooker Hopping John. Black eyed peas slow cooked with smoked sausage, tomatoes, peppers, seasonings and rice. SO simple and so delicious! All you need is some fresh cornbread and you have the perfect New Year's Day meal! This makes a TON! Invite some friends over to watch all the bowl games and have a bowl of Hopping John! Yum! Looks like a big ol' bowl of comfort! A little confused on ingredients - is it 1 can of diced tomoatoes and 1 can of green chilies -OR- 2 cans of each item? I'm guessing it means 2 cans od Ro-Tel. It wasn't super spicy - maybe use Mild Rotel instead of regular. Can I use chicken broth instead of beef broth? I made this recipe last night as I have to take to friends today. By 10:30pm it was to die for. Made it last year with great success but somehow this year is even better. At Walmart I found cans of “Margaret Holmes Hoppin John with black eyed peas and peppers” and cans of “Rotel fire roasted diced tomatoes & green chilies”. I believe they both made this dish. As I had to double the recipe I put everything in a big bowl after browning the sausage, mixed it all well and divided it equally between two big crockpots. During the last half hour I added my already cooked rice and voila! Darn, it’s only 6:30am and I am dying for a bowl! Lunch is a long way off ����.